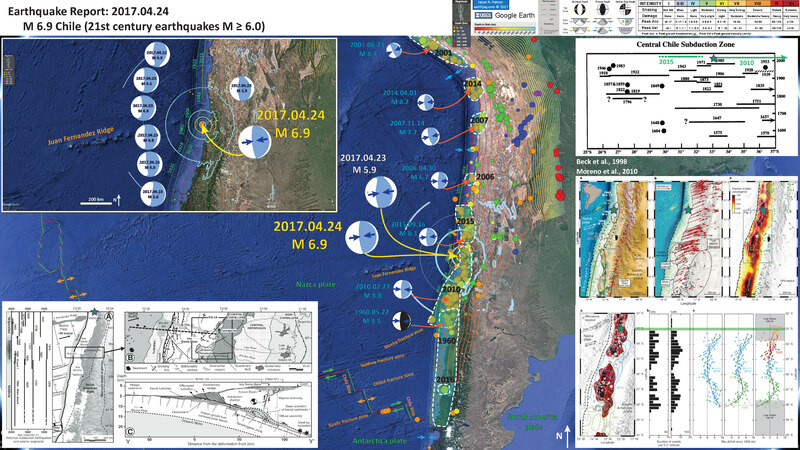 Well, we had another earthquake in the region of a recent (yesterday and the day before) swarm offshore of Valparaiso, Chile (almost due west of Santiago, one of the largest cities in Chile). 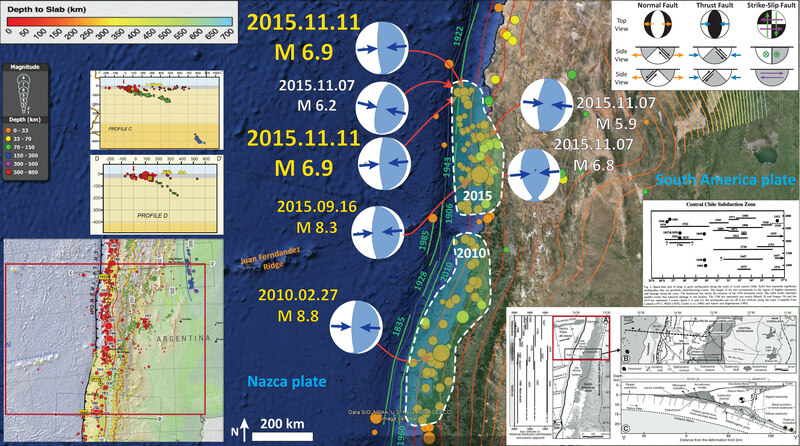 My previous report on the M 4-5 earthquakes can be found here. The earlier swarm was a series of shallower earthquakes (though some were of intermediate depth and some were deeper). The M 6.9 earthquake, in contrast, is deeper and likely on the megathrust. The slab contours are at 20 km and the hypocentral depth is 25 km (pretty good match considering the uncertainty with the location of the megathrust). Another difference is that the M 6.9 has a greater potential (likelihood, or chance) to damage people or their belongings. I plot the seismicity from the past month, with color representing depth and diameter representing magnitude (see legend). I include the USGS epicenters for earthquakes from 1917-2017 with magnitudes M ≥ 6.0. I outline the regions of the subduction zone that have participated in earthquake slip during the 21st century (in white dashed polygons). I include USGS moment tensors from the largest earthquakes. I plot the focal mechanism for the 1960 earthquake from Moreno et al. (2011). Note the gap in seismicity in the region of the 1960 M 9.5 earthquake, except for the 2016 M 7.6 earthquake. Also, note how the 1960 and 2010 earthquake slip patches overlap. In the lower left corner, I include a map and a cross section of the subduction zone just to the south of this Sept/Nov 2015 swarm (Melnick et al., 2006). I placed a green triangle at the approximate location of this 2017 swarm. In the upper right corner I present Figure 2 from Beck et al. 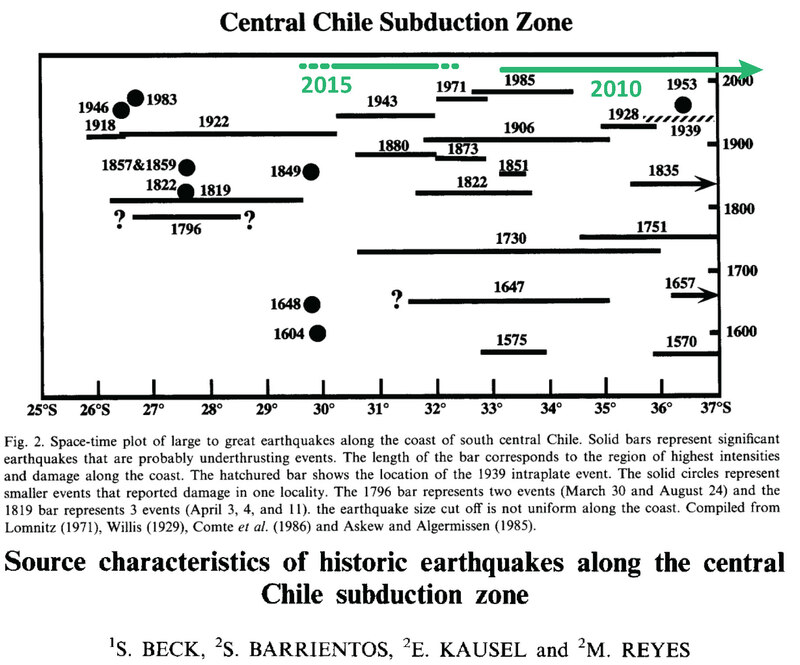 (1998 ) on the map, the space-time plot of historic and prehistoric earthquakes associated with the Chile subduction zone. I add a green line showing my interpretation for the strike length of the 2015 M 8.3 earthquake. Originally it appeared to match the 1943 and 1880 earthquakes, though it appears to extend further along strike. The 1922 and 1880 strike lengths are not well constrained, so this 2015 earthquake may indeed be slipping the same patch of this part of the subduction zone. Indeed, Juan Fernandez Ridge may be a structural boundary that may cause segmentation in this part of the subduction zone. If it does, it does not do so every time, as evidenced by the strike-length of the 1730 AD and 1647 AD earthquakes. I placed a green triangle at the approximate location of this 2017 swarm. This M 6.9 appears to be correlative in space with the 1985 earthquake (albeit a much smaller magnitude, closer to the 1971 in size). In the lower right corner I include two figures from Moreno et al. (2010). 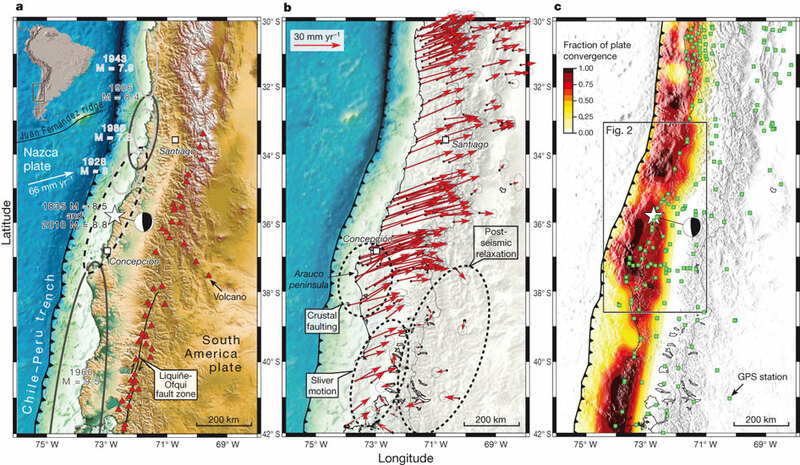 The upper one shows the spatial extent of historic subduction zone earthquakes in this region, the GPS velocities, and the fraction of plate convergence attributed to fault seismogenic coupling. 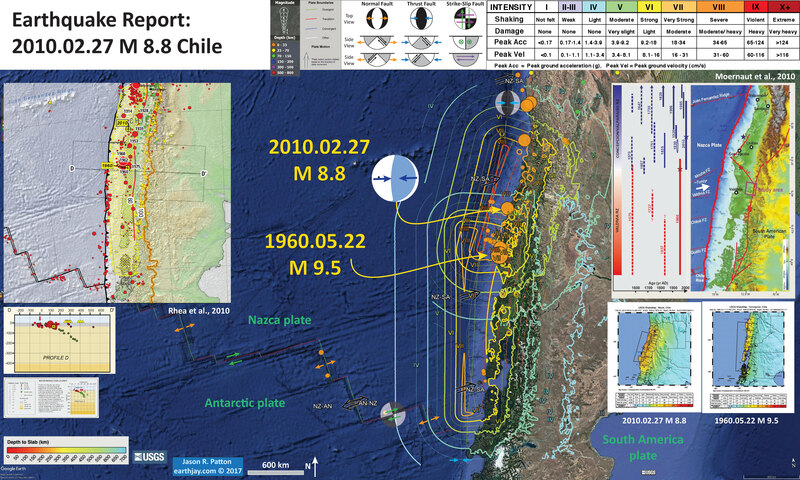 The lower panel shows the amount of slip that is attributed to the 1960 and 2010 earthquakes (on the left) and various measures of seismicity and slip deficit (on the right). I place a green star in the general location of the M 6.9 and a green horizontal bar that matches the latitude of this M 6.9 earthquake. In the upper left corner, I include a local map showing the MMI contours for the M 6.9 earthquake. I include the USGS moment tensors from most of the earthquakes in this swarm, including the M 6.9 earthquake. As mentioned above, this earthquake has the potential to cause more harm than the earlier earthquakes due to its larger magnitude. Below is the USGS report that includes estimates of damage to people (possible fatalities) and their belongings from the Rapid Assessment of an Earthquake’s Impact (PAGER) report. More on the PAGER program can be found here. An explanation of a PAGER report can be found here. PAGER reports are modeled estimates of damage. On the top is a histogram showing estimated casualties and on the right is an estimate of possible economic losses. 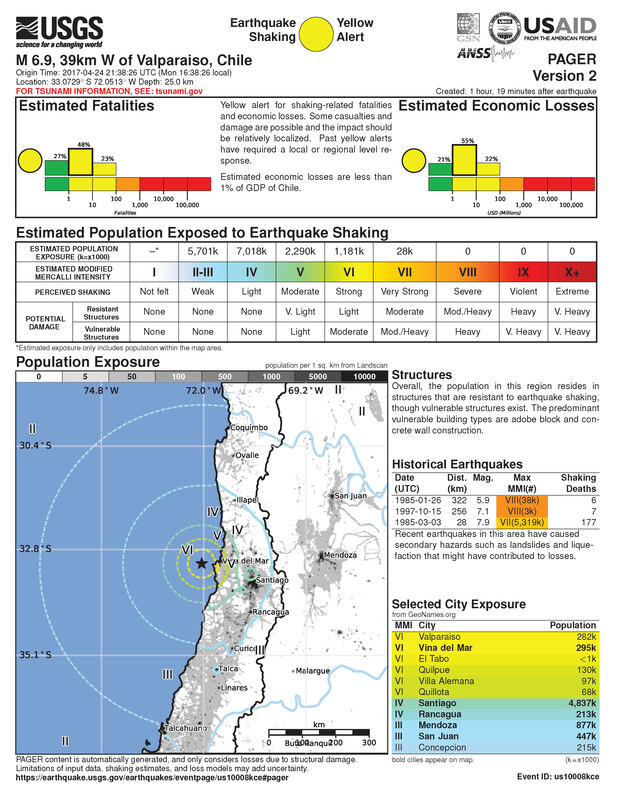 This PAGER report suggests that there will be quite a bit of damage from this earthquake (and casualties). This earthquake has a high probability of damage to people and their belongings. UPDATE: Below are some observations of the tsunami. This comes from the Pacific Tsunami Warning Center. Here is the first of two figures from Moreno et al., 2010. Note that the M 6.9 is close in space to the 1985 earthquake. I include the figure caption below in blockquote. Here is the second of the two figures from Moreno et al. (2010). Relationship between pre, co- and postseismic deformation patterns. a, Coseismic slip distribution during the 2010 (blue contours; USGS slip model26) and 1960 (green contours; from ref. 30) earthquakes overlain onto pre-seismic locking pattern (red shading $0.75), as well as early (during the first 48 h post-shock) M$5 aftershock locations (the grey circle sizes scale with magnitude; GEOFON data29). b, Histograms of early (first 48 h; total number of events, 80) and late (first 3 months; total number of events, 168) aftershock density along a north–south profile (GEOFON data29, M$5). 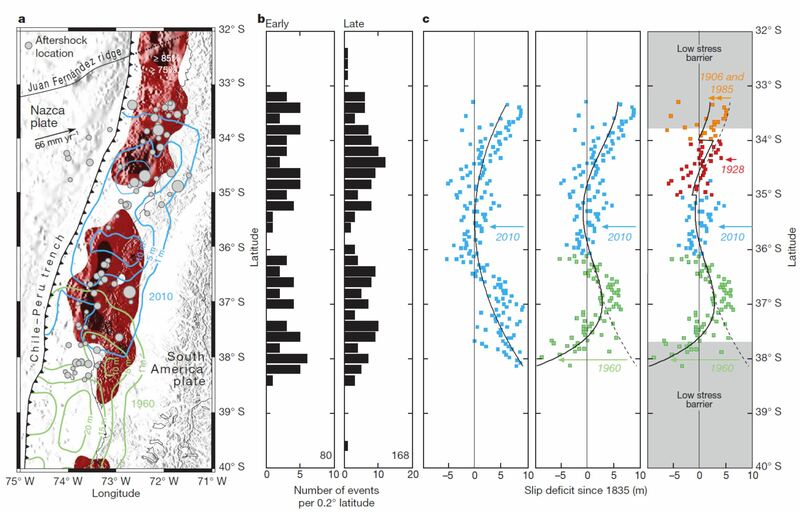 c, Residual slip deficits since 1835 as observed after the 2010 earthquake along a north–south profile (left column, based on the USGS slip model26). The middle and right columns show the effects on slip deficit of overlapping twentieth-century earthquakes (the black lines are polynomial fits to the data). Coloured data points and dates indicate earthquakes by year of occurrence.